$1,950.00 (1990) . . .
no bids (asked $150) 4/2/02 #1717098164 j.a. 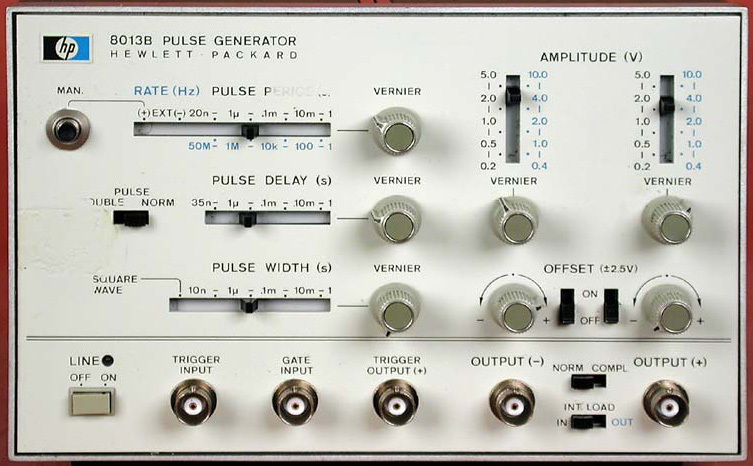 The 8013B Pulse Generator has two outputs providing simultaneous pulses of opposite polarity plus a switchable internal 50 ohm source. 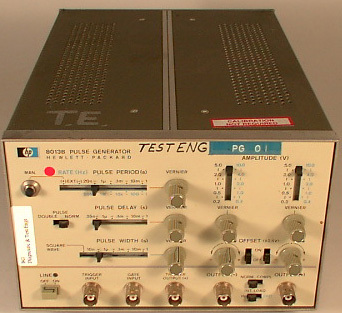 Transition times are fixed at 3.5 ns and pulse width is continuously adjustable from less than 10 ns to 1 s. Repetition rate is also continuously adjustable from 1Hz to 50MHz. Maximum output is 10 V across 50 ohms and can be reduced via a four-step attenuator to 0.4 V. Pulse delay can be set from less than 35 ns to 1 s (with respect to trigger output), continuously adjustable over four ranges. Square wave output is adjustable from 0.5Hz to 25MHz in four ranges.